Capitalism isn’t the road to riches for everyone. Take the examples of the 1990’s dot-com boom and bust, or the 1929 stockmarket crash (as well as a series of disastrous depressions across earlier decades), not to mention the imploding speculative European market disaster known as the South Sea Bubble of the early eighteenth century. And the curious case in the United Provinces of the Netherlands of 1636 that came to be known as Tulipomania. The mania for the buying and selling of tulips might sound as though it were more in league with the trading of collectibles like football programmes, comic books, or Cabbage patch dolls, but this floral fever exploded into a full-blown economic frenzy that touched every strata of Dutch society. In the course of about a year, prices of tulip bulbs sold among the usually sensible population of Holland went from reasonable to outlandish. A single rare bulb could be — and was! — traded for an entire estate, landholdings and all. Tradesmen sold their businesses and ploughed the profits into the tulip trade. It was the first futures market in the world. Fortunes were made in a single transaction, while even greater riches were lost in the headlong rush of speculators fleeing the collapsing market. The legal entanglements that ensued were so complex, legislators finally threw up their hands in surrender and left it for local courts to make sense of it all. All this over the simple, elegant tulip — and mans seeming inability to avoid being sucked into even the most ludicrous fits of speculation when the smell of a fast buck was in the air. While the names of some of the culprits of this floral bubble have been lost to history, their deeds live on, as in the case of a house in the town of Hoorn with three stone tulips carved into its façade, commemorating its sale in 1633 for the price of three rare tulips. It’s here that many believe the Dutch mania for tulips began, when word spread that someone had sold his entire house for three flowers! Known among botanists by the name Tulipa (derived from the Turkish word tulpend, or “turban,” which the flower resembles), the wild variety of the flower is native to Turkey and western and central Asia. Though a few species occur in Europe, and though we’ve come to think of Holland as the home of the tulip, the flower was unknown there until sometime in the sixteenth century. Tulips had been cultivated in Turkey for centuries before they found their way into the gardens — and economic history — of the Netherlands, thanks to the botanist Carolus Clusius. The aged scientist brought the flower home with him from a visit to Constantinople in 1593 to the University of Leiden for purposes of medicinal research. Though always happy to share his finds with fellow scientists — Clusius was a respected researcher and writer on medicine and pharmacy in addition to botany — he refused to sell any of his rare tulips to envious neighbours who sought this new plant for their gardens. Of course, to be fair — and to help explain the scarcity in the coming craze — tulips can be grown from either seed (a slow — some six or seven years — and chancy process for achieving a specific variety of flower) or by producing offsets, or outgrowths, of the mother bulb, which become flowering bulbs in their own right within a year or two. A bulb, however, can produce only two or three offsets a year for only a couple of years before the mother bulb is depleted. At least one of Clusius’s neighbours discovered a way around the old scientist’s reluctance to part with his precious plants. He stole the bulbs right out of his garden. Soon thereafter, tulips began sprouting in the gardens of many of the Dutch merchant class, men newly made rich by the lucrative East Indies trade and not shy about displaying their wealth. The number of the cultivated varieties of these lovely blooms increased quickly in the hands of their Dutch growers, producing thirteen new groups of tulips with names like Couleren, Bizarden, Violetten, Marquertrinen, and Rosen, each of which could have produced literally hundreds of varieties, all based on their colour schemes. The flowers were explosions of brilliant hues, solid and striped, some with gilded edges, some veined with startling flames and flares of contrasting colours. Purples and reds and yellows and pinks, purples and browns, colours more intense than anything else in the gardens of Holland. The tulip soon became the rage; indeed, possessing a collection of these lovely blooms was seen as evidence of taste and breeding among the rich. Wanting to also be viewed as tasteful and well bred, the middle class soon joined in the mania and, throughout the early part of the century, the price of tulip bulbs rose at a steady pace. The first superstar of the tulip world was the celebrated Semper Augustus, a flower of the Rosen group of such breathtakingly intense reds and vivid blues and whites that it was universally hailed as the finest tulip ever grown. Again, its owner’s name was lost — or withheld — by history, but by 1624, all the estimated one dozen examples of this rare flower were in the hands of this single man. Offers were made to buy bulbs of this rare bit of beauty, but the man spurned them all in favour of keeping the majestic bloom to himself. It was reported that offers as high as two to three thousand guilders (one guilder was the approximate daily wage for a Dutch craftsman) were put on the table for a single Semper Augustus bulb. The inability to lay their hands on this most precious of the precious flowers drove the rest of the Dutch connoisseurs mad with envy, and they tried to retaliate by pushing the best specimens of their own collections to rival in both beauty and value the Semper Augustus. None ever succeeded. But this desire to own what they couldn’t have caused competition between collectors to grow and, more important, prices to push upward at a faster pace than before. While Mackay was writing about the behaviour of people in general, that description perfectly fits the Dutch of 1636–1637. The craze to own tulips and, more important, to sell them for huge sums of money or goods suddenly jumped from the upper classes to spread like head lice through every level of Dutch society. It became an all-consuming mania. Anyone with a few stuivers to rub together was jumping on the tulip bandwagon, with an informal network of futures markets setting up in hundreds of taverns across Holland. By the winter of 1636–1637, the Netherlands was at the height of the tulip frenzy. Bulbs could be bought and sold a dozen times in a day — all while lying dormant in someone’s home or garden. Since tulips bloom only for a few days a year, these people weren’t even buying pretty, vibrant flowers; they were laying their life savings on a bulb that strongly resembled an onion (indeed, there’s the wonderful story of a hungry sailor mistakenly slicing up and consuming a valuable Semper Augustus whilst carrying a cargo of tulips back to port). Weavers sold their looms, farmers their lands, blacksmiths their forges to get their hands on the money to get into bulb trading. A group of professional tulip traders, called “florists!” soon evolved, and money was being made everywhere by nearly everyone, much of it on paper in the form of futures — an agreed-upon price of a specific bulb at a specific time in the future. The tulip trade, because it dealt in a product that its buyers seldom saw, came to be known as the Wind Trade. But the harder the wind blew, the higher the prices rose, and not even the sky seemed the limit. Then came that fateful day. On February 5, 1637, saw the auction of the estate of Wouter Bartelmiesz Winkel, one of the richest men in the town of Alkmaar. Wouter Winkel (what a great name) had managed to acquire through shrewd trading a valuable collection of some seventy-five top-of-the-line specimens — in addition to a goodly load of more common, though still valuable, flowers — including a rare Admirael van Enkhuizen, some Viceroys and various Brabansons, not to mention a few rare Rosen Admirael van de Eijacks, and others. 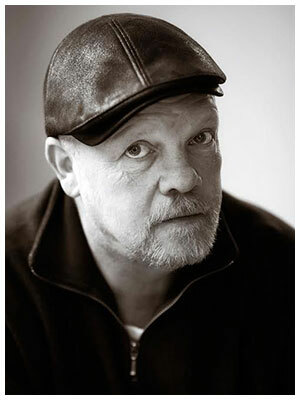 After his death, his seven orphaned children were left to collect the proceeds of the auction: almost 90,000 guilders! Though on the face of it the Wouter Winkel auction appears to have been a good thing for the Wind Trade, it seemed instead to have been the straw that broke the camel’s back. Indeed, just two days earlier, in a tavern in the city of Haarlem, in a regular trading session of florists, an offering of tulips did not sell, even after the auctioneer repeatedly dropped the price. Word spread across Haarlem, then to other trading towns, and with it went a panic that grew at an even faster pace than the mania that preceded it. It was as though those few fateful minutes in that Haarlem tavern were the reawakening of common sense among the speculators, a feeling that, like the contents of Pandora’s box, once unleashed could not be recalled. Prices plummeted. 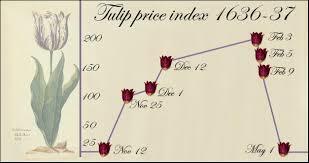 A tulip worth 5,000 guilders before February 3 sold for 50 guilders soon thereafter. The fortunate speculator would see a 5 percent return on his pre-bust investment; most would be lucky to get back 1 percent of what they invested. Of course, Tulipomania was a bubble built on a dream, a case of supply and demand tripping over one another for a few frantic months until finally neither could stand. And, as was her wont, Mother Nature had the last laugh on the speculators and opportunists: in the wild, tulips were a solid colour, usually red, yellow, or white, unlike their cultivated brethren. The cause of the riot and intensity of colours and varieties of Dutch tulips, including the most highly valued Semper Augustus, was a virus, a disease unique to the tulip! In the end, the Dutch mania for tulips cost many of the speculators, collectors, and florists fortunes that were never to be recovered. Unlike later speculative bubbles that burst after over-expansion, Tulipomania never did reach into the core of the nation’s economy. Private fortunes and personal holdings were lost to the tune of uncounted millions of guilders — again, many of these fortunes existed only on paper to begin with — but the Amsterdam stock exchange kept well away from the Wind Trade. Thus, the effects on the Dutch economy were negligible at best, but it remains a national embarrassment and, of course, a handy object lesson with which the pundits can chide modern-day dot-commers…even as they continue to stock up on scarce football programmes and rare Pokémon cards as a hedge against the future. And a future opportunity to retell the wonderful story of the rise and fall of Tulipomania.